Crown Chemical Products Inc. is a custom blender and packager of Acids, Powders and Liquids. Our staff can call on more than 30 years of experience to insure that you, the customer, will get the best quality product at the most reasonable price. The Crown Chemical Brand is an industry standard for superior quality. All of our industrial cleaners and degreasers are specially compounded to work for the specific applications. Our industrial cleaning solutions are designed to be safe for the user and the environment without sacrificing performance. Our contract packaging / private labeling services are designed to meet your needs. Successful brand awareness and market penetration requires that a product clearly be differentiated in quality and/or performance. Differentiating the packaging can contribute to this success as packaging clearly helps to identify the unique image the product or product family may have. 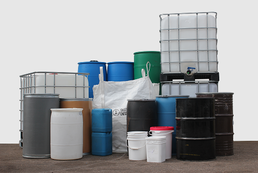 We have the capability to fill pails, drums, and totes efficiently satisfying all your private label chemical manufacturing needs.In addition to packaging, we also offer chemical compounding services for both liquid and powder. We offer personal, yet professional service, building relationships with customers to ensure we meet all of your needs and exceed your expectations. Our long-term, highly-trained employees are fully committed to the principles of continuous improvement in every area of operation including manufacturing productivity, efficiency, product design, quality, delivery performance, health and safety and environmental practices.We distribute to businesses coast-to-coast across Canada and look forward to adding your company as a valued customer. Our goal is to reduce and eliminate the environmental impact of its products in order to protect the natural environment. In addition to meeting regulatory requirements and maintaining the standards established by Environment Canada and the Ontario Ministry of the Environment, we uphold the highest ethical standards for the management of chemical products.